Solar water heating systems can generate between 50-60% of your hot water. Solar water heating panels are placed on a South facing roof or mounted on frames placed on a flat roof or on the ground. These panels are then angled between 15 – 75 degrees to maximise the exposure to the Sun’s rays which are used to heat water stored in a tank. By installing a solar water heating system, not only would you be reducing your carbon footprint, you can also make savings on your energy costs. The saving generated will vary depending on the size of the property, the size of the solar water heating installation and the amount of sunlight in your area but some householders have been known to reduce their annual energy bills by anything between 30-70%. A solar water heating system will also provide you with hot water throughout the year and can be backed up by a boiler or immersion heater in the colder months when there is not as much sunlight. Very impressed with the quality of the work done. 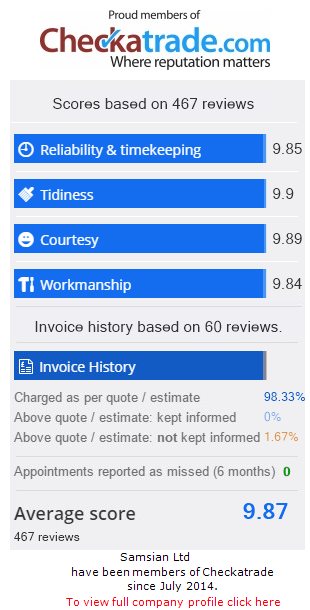 This is a very well run local business with high professional standards and easy to deal with. Their workmen were courteous and friendly – you wouldn’t have believed they had been except for the desired result of an updated heating system.